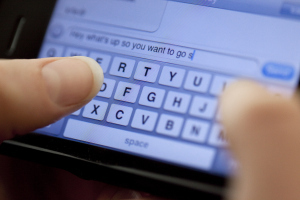 How Texting Affects Your Family Law Case | LeBaron & Jensen, P.C. In the age of the smartphone, texting is an increasingly prevalent form of communication. Many people feel more comfortable sending a text message rather than calling or sending an e-mail to the other person. What does this have to do with family law? Because mobile carriers keep records of text messages, texts create a paper trail of proof. This can be quite helpful or harmful to your case. For example, imagine that two spouses agree through a text message discussion to a particular custody arrangement. Later on, if one spouse reneges upon the agreement, the text records can be used to prove the agreement.